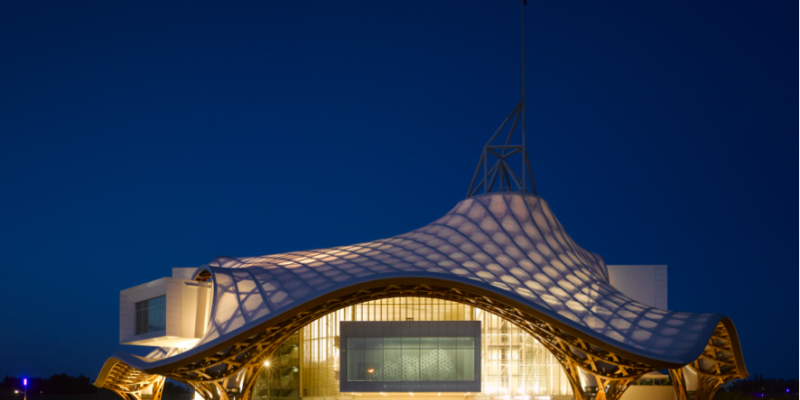 The Pompidou-Metz Center, an architectural feat designed by Shigeru Ban and Jean de Gastines, covers 10,700 sq. meters and includes exceptional private areas of various sizes for conferences, seminars, product launches, fashion shows, cocktail parties, dinners etc. Privatization of spaces may be associated with private visits to exhibitions. Modular space that can accommodate a conference or, thanks to its retractable bleachers, a standing cocktail or a seated dinner. Space perfectly adapted to conferences, debates, seminars, round table and presentations. 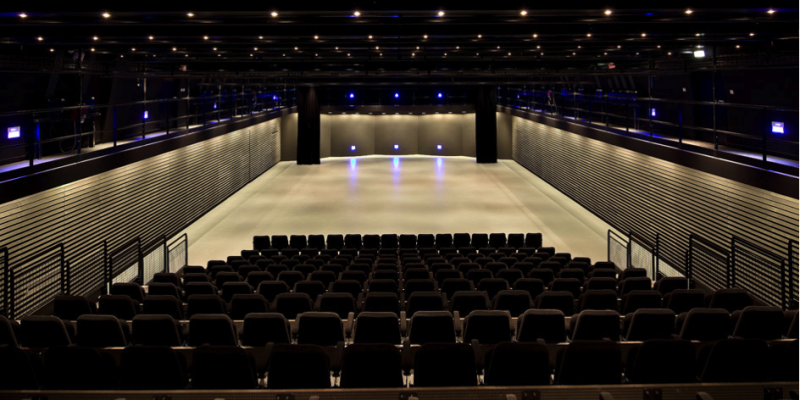 The Wendel Auditorium has a projection system, a fixed screen and remarkable acoustics. Equipped with modern and comfortable design furniture, this space is perfectly designed for holding business meetings. Located next to the restaurant of the Pompidou-Metz Center, the Constellation Room allows meetings or prestigious meals to be held in an exceptional setting. Its large bay windows offer a view of the Amphitheater. A monumental space with the impressive translucent roof of the Pompidou-Metz Center, the Forum hosts prestigious receptions. It is equipped with large bay windows, which open up during the beautiful season to a closed garden. Organize a prestigious lunch or dinner in the exceptional setting of the Grande Nef and enjoy a special moment among the masterpieces! The Galleries offer exceptional views of the city of Metz, including a unique view of the Cathedral of Metz from Gallery 3. The building has been designed to provide maximum accessibility to people with disabilities. It is made up of a pluridisciplinary plateau on the groundfloor allowing easy access to different areas: Grande Nef, Studio, Wendel Auditorium , Bar 333, Gardens, Ici et Là Area, Librairie Flammarion. Ticket offices, the Studio and the Wendel Auditorium are equipped with loops for the hearing impaired. Wheelchairs are available to the public. Access: drop-off area tolerated in front of the entrance of the Pompidou-Metz Center. On foot 2 minutes from Metz Ville TGV train station, 10 minutes from the historic center. METTIS A and B, station Pompidou Metz Center - a METTIS train every 5 minutes on the common core. ARTEO SHUTTLE, Pompidou-Metz Center stop - an ARTEO SHUTTLE every 10 minutes. Motorways A4 (Paris / Strasbourg) and A31 (Luxembourg / Lyon), exit Metz Center. An underground car park is accessible by avenue François Mitterrand, daily and 24 hours a day. Parking for 700 cars. Motorways A4 (Paris / Strasbourg) and A31 (Luxembourg / Lyon), exit Metz Center. A group minute drop-off area is available on Avenue François Mitterrand and then parking spaces reserved for buses and coaches are accessible from the Louis Débonnaire Avenue. TGV train station Metz Ville. Direct trains: 1h20 from Paris, 40 min from Luxembourg City. Gare Lorraine TGV (29 km from Metz, shuttles available) Direct trains: 2 hours from Lille Europe, 4 hours from Rennes, 5 hours from Bordeaux. Airport of Metz-Nancy Lorraine (33 km / 20 min), airport of Luxembourg (69 km / 45 min), airport of Saarbrücken (79 km / 1h), airport of Zweibrücken (110 km / 1h20). Located in the heart of the Pompidou-Metz Center and its works, close to the city center and the train station, the restaurant White Sail welcomes you in a warm atmosphere. A traditional cuisine based on products of the market constantly updated with the taste of the day.